A DIFFERENT kind of reunion took place at the 2015 Condura Skyway Marathon on Sunday. 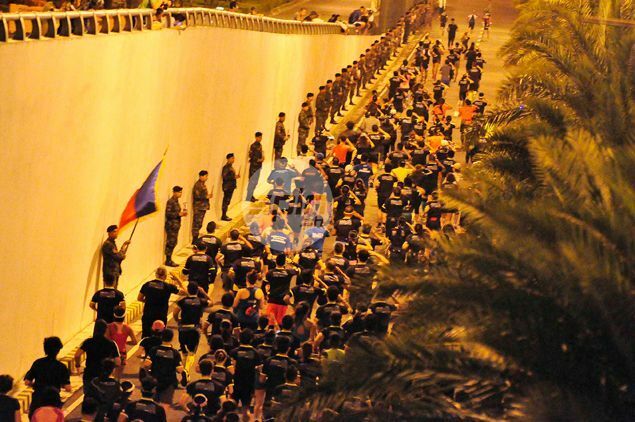 Shortly after leaving the start line at Filinvest City, runner Pamela Buasen saw a familiar face among the 44 members of the PNP Special Action Force standing at attention along the tunnel leading to the Skyway ramp. He turned out to be police officer Michael Bakidol, who was holding a photo of Police Inspector Gednat Tabdi, one of the 44 members of the PNP SAF who died in a violent clash with Muslim secessionists in Maguindanao last week. Bakidol, Tabdi and Buasen were classmates in Benguet State University. “To see the runners give honor to them was really something we’ve never seen before,” said Ton Concepcion, CEO and founder of the Condura Skyway Marathon, visibly touched by the spontaneous outpouring of support for the slain SAF men. 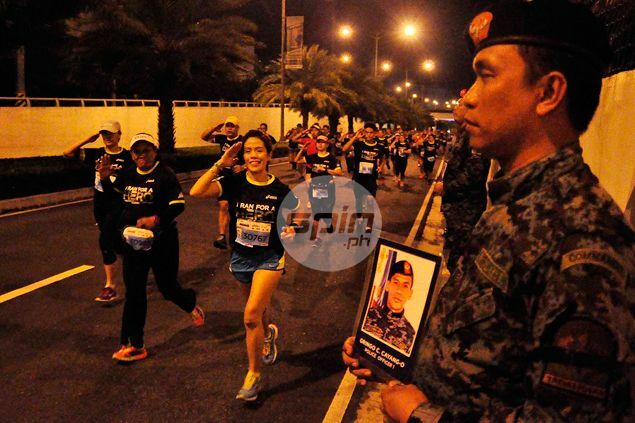 A record turnout of 15,500 runners paid tribute to the 'Fallen 44,' as the slain SAF men are collectively known, in different ways. Runners saluted the policemen as they passed by. Some wore arm patches and printouts with the word TAGALIGTAS, the official symbol of the PNP SAF, while others reversed their race singlets to signify distress. Organizers have also decided to add the families of the slain SAF as recipients of the race fees, which were initially meant solely for the Hero Foundation. “There has been a huge outpouring of support. People wanted to do something,” Concepcion said. First time marathoner Raymond Sabalbaro said he was proud to run for the fallen heroes. "Medyo kinilabutan ako. I'm proud na yung pinaghirapan namin mapupunta sa kanila. Makakatulong ka sa hindi mo naman kakilala pero alam mo worth yung pinagpaguran mo sa mga pamilya nila," said Sabalbaro, a sales executive. The names and photos of the “Fallen 44” were each held by a commando in the first 4.4 kilometers of the course after the start line at Filinvest City in Alabang, Muntinlupa City. At the head of the line was a flag bearer. Kenyan runner Jackson Chirchir was fastest overall from the record 6,400 entries who ran a full marathon, clocking two hours, 29 minutes and 33 seconds. Coming in second was Rafael Poliquit Jr. and completing the podium was Anthony Merza. “We broke a record today,” Concepcion said. In the female category, national duathlete team mainstay Miscelle Gilbuena was the fastest Filipina at 3:21:37. Criselin Jaro and Aileen Tolentino came in second and third, respectively. Gilbuena, a member of the Philippine Air Force, said it was the thought of the sacrifices made by fellow members of the military and police forces that motivated her. "Kahit kulang yung training mo, maiisip mo yung grabe na sacrifice ng mga military natin. Tiis lang talaga," she told Spin.ph after her victory, which she dedicated to her family. "Masarap 'yung pakiramdam na tumakbo sila (other runners) para tulungan yung mga families," she added. In an interview with Spin.ph, one of the PNP-SAF who took part in the honor line, PO2 Ciubal, said he was overwhelmed by the gesture accorded his fellow policemen. ”Naramdaman namin gaano kaimportante at gaano kahalaga ang ginawa ng mga kasamahan naming sakripisyo para sa bayan para mapuksa ang terorismo,” Ciubal, who declined to give his full name, said. The honor coming from ordinary Filipinos had a profound impact on him. “Nakikita namin yung importansya at respeto nila sa law enforcement, lalo na ng mga taong bayan. Nakikita namin yung tiwala nila. Vina-value nila yung sacrifice ng buhay ng mga kasama namin,” he said. It was clear PO2 Ciubal was at a loss for words to describe what he felt. "Napakahirap ipaliwanag. Nung nagsisimula yung program, nararamdam ko talaga yung sinseridad ng mga tao, kung gaano kahalaga yung ginawa nila. Mostly mga classmates ko yung mga namatay kaya tinatayuan ako ng balahibo," he said. In the end, the SAF could only show its appreciation for what the runners that morning gave them. "Nagpapasalamat ako sa mga taong nag organize sa activity na ito para maparamdam nila yung sympathy sa mga pamilya nga mga taong pumanaw," Ciubal said.